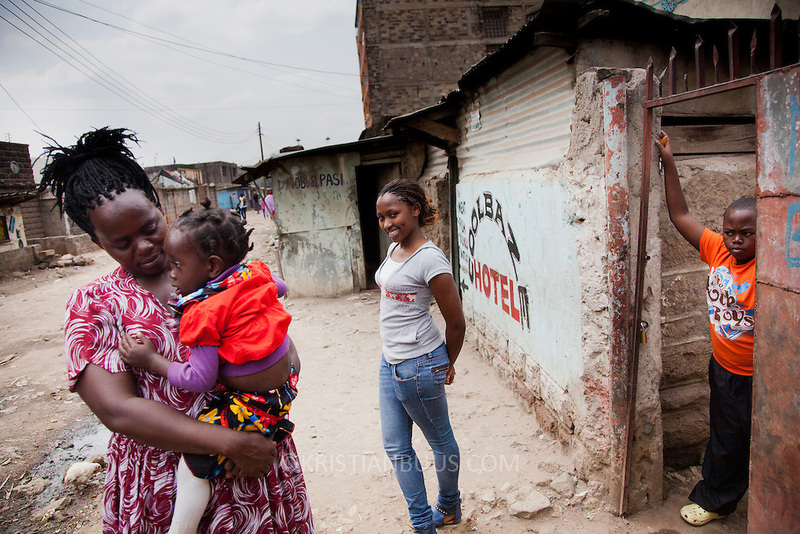 Caroline Mbulwa, 24, outside her house with her mother and siblings. Caroline is a Nairobits graduate and now works a successful web designer. She is the sole provider of the family and with her income they have managed to buy a new home in a better part of the slums. Nairobits is a charity teaching kids from Nairobi's slums It and train them to get work in the IT sector.Every year 1mill young people graduate and leave school and only 1/3 have any hope of getting a job. Nairobits aim to train more than 500 young people / year from the slums, some with only basic formal education, how to set up their own business or get a job in the growing IT sector in Kenya.